I had some fun Easter crafts planned for this year. We were going to do that this weekend. Then my son got invited to a sleep over and ditched me and my crafting! So I decided to take a walk down memory lane and reminence on the past Easter projects we’ve done together! That’s the one thing about the blog, projects get buried! The first Easter project I made for the kiddo was the super easy Bunny BaRoo stuffy! He was pretty cute if I do say so myself! Another early project was a beautiful yarn wreath by Hugs, Kisses and Snot. I just love the felt lilies! And you should check out her site, because she has another beautiful wreath posted recently! I LOVED perler beads as a kid, so you know I am super excited that my kiddo loves them too. Even though he insists they are called Fuse Beads… One year we made Easter cards with Perler Beads Easter decorations! And last year we used toilet paper rolls to stamp Easter egg placemats! These I made a no sew project, but you can stamp on anything! 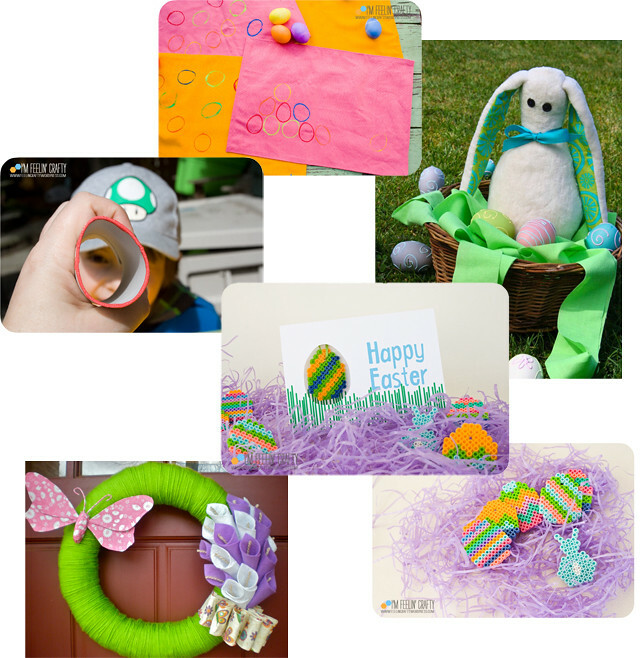 I’m still going to get some Easter crafting on with the kiddo before the big day comes though… Have you made any Easter crafts this year?